For soft, thin hair. Gentle on scalp. Good for permed/coloured hair too. Apple & Peach fragrance. 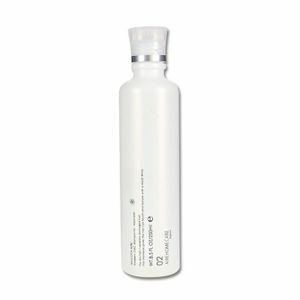 MUCOTA Aire 02 nourishes the scalp with moisture with its gentle, hydrating lather. Ceramide analogue and CMC amino components work to condition the hair and smooth dry or frayed hair strands. CMC is the cell membrane complex which holds the bonds of hair strand cells together. It keeps moisture from escaping and makes hair tough against damage. This hair shampoo is most suitable for those who have damaged hair. Aire 02 makes hair silky and manageable. The Aire 02 shampoo comes in a Sweet Mangosteen scent. This is the 250g bottle. A 700g refill is also available. Rinse your hair well first, then shampoo and rinse. The Mucota Adllura Aire line is highly customisable. You can choose a shampoo and treatment tailored to the thickness and qualities of your hair. For damaged hair, add a weekly treatment. Finally, choose a leave treatments to care for your hair while adding a healthy look. Water, disodium (C12-14) pareth-2 sulfosuccinate, sodium cocoyl alanine, glycerin, cocamide DEA, cocamidopropyl betaine cetrimonium chloride, sodium PCA, sodium lactate, polyquaternium-10, phenoxyethanol, arginine, aspartic acid, PCA, stearyl trimonium chloride, glycine, alanine, ceteth-20, serine, valine, citric acid, butylene glycol, isoleucine, etc. Looking for the best deals for MUCOTA Aire shampoos? Be sure to put this into your wishlist by logging in, or sign up today to enjoy 500 points discount immediately~ Wonect offers FREE deliveries worldwide and has daily deals, so do check back for the best prices from Japan!